St. Agnes Anglican Parish Church is situated on Clarence Street in St. James in the twin island Republic of Trinidad and Tobago and has been at that location since 1929. 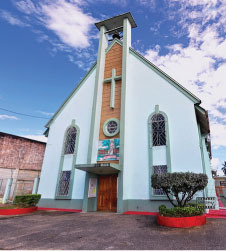 The church is a parish of the incorporated trustees of the Anglican church in the diocese of Trinidad and Tobago. At St. Agnes you will feel welcomed and find many ways to grow spiritually through our worship and educational offerings. We invite you to visit us at our Sunday service at 7:00AM or 9:30AM every Sunday. St. Agnes partnered with Western Pharmacy as part of their "Neighbor Neighbor" initiative to host two seminars entitled "Planning for the inevitable" and "Diabetes".